Products of the chemical industry are used as consumer goods and agriculture supplies, in manufacturing, construction, and service industries. Export Portal offers a wide range of products of the chemical or allied industries to fill up any need in these sectors. Pyrotechnics, matches, paint, dye, inks, putty, tanning - anything can be found here. Modern chemical industry converts raw materials (oil, natural gas, air, water, metals, and minerals) into more than 70,000 different products. Major industrial customers include rubber and plastic products, textiles, apparel, petroleum refining, pulp and paper, and primary metals. 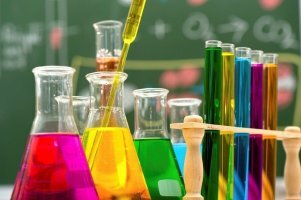 Sales of the chemical industry can be divided into a few categories, including basic chemicals, life sciences, specialty chemicals and consumer products. On Export Portal you will find all the categories and types of chemical industry products! Basic chemicals, or "commodity chemicals" are a broad chemical category including polymers, bulk petrochemicals and intermediates, other derivatives and basic industrials, inorganic chemicals, and fertilizers. Life sciences include chemical and biological substances, pharmaceuticals, diagnostics, animal health products, vitamins, and pesticides. Pesticides, also called "crop protection chemicals", are about 10 percent of this category and include herbicides, insecticides, and fungicides. Consumer products include direct product sale of chemicals such as soaps, detergents, and cosmetics. Polymers and speciality chemicals used in consumer products manufacture are the materials encountered everywhere in everyday life, such as in plastics, cleaning materials, cosmetics, paints and coatings, electronic gadgets, cars and the materials used to construct houses. These speciality products are marketed by chemical companies to the downstream manufacturing industries as electronic chemicals, construction chemicals, industrial cleaners, flavours and fragrances, speciality coatings, printing inks, food additives, paper chemicals, oil field chemicals, cosmetic chemicals, textile chemicals, waxes, polish, candles, dental products, glue. Buy organic chemicals and other chemical products online on Export Portal to get the best deals and results! If you want to sell chemical products such as photographic and cinematographic goods or pharmaceutical products, our site is a great choice as well.